For the enthusiast looking for a quality performance hose while wanting to save assembly time and money, Russell Twist-Lok Hose is the way to go. Easy to assemble, flexible and lightweight, it is ideal for most automotive applications where a stainless steel braided line is not necessary. This hose is Pressure rated up to 250 psi - suitable for most fuel and oil systems (not for power steering applications) * Approved by NHRA for use in competition. 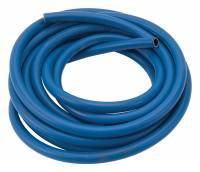 Russell Hose Twist Lok Blue #10 x 25 Ft.
Russell Hose Twist Lok Blue #8 x 25 Ft.
Russell Twist-Lok #8 Hose - Black - 25 Feet.